The U.S. job market keeps proving doubters wrong: Job growth may be slowing, but there is no sign that the recovery is nearing its end. U.S. employers added 287,000 jobs in June, the Bureau of Labor Statistics said Friday. That figure was inflated by the return of about 35,000 Verizon employees after a six-week strike. But even removing the strike’s impact, June’s job gains far exceeded economists’ expectations and represented a sharp rebound after two months of disappointing hiring. 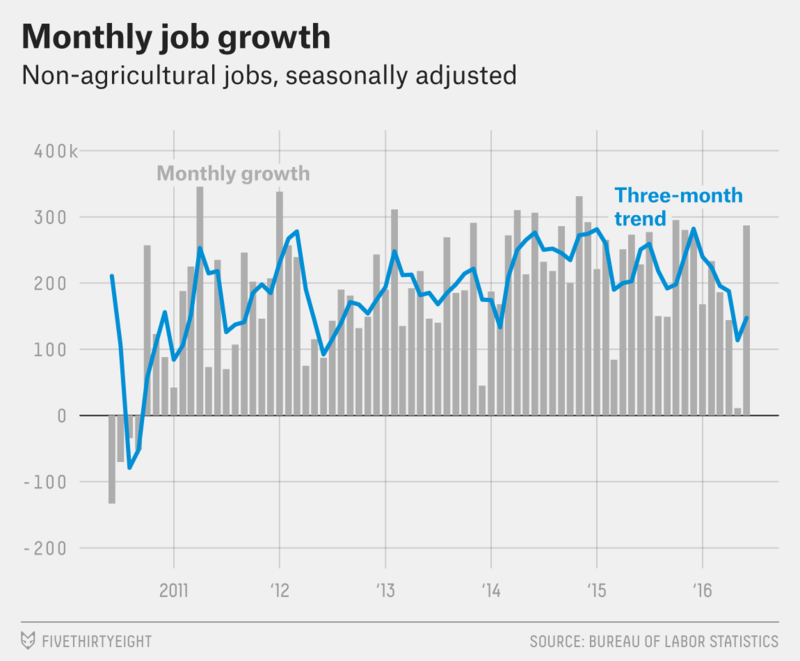 Taken at face value, the numbers suggest that after six months of scorching growth, the job market slowed sharply in April and May, then picked up again in June. But that is almost certainly the wrong interpretation. Rather, it makes more sense to look at the longer-run trend, which shows job growth gradually cooling but remaining basically strong. That gradual slowdown is not surprising, nor necessarily a sign of weakness in the broader economy. The U.S. has added jobs for 69 straight months, the longest streak on record, and the unemployment rate has dropped below 5 percent. That means there are simply fewer workers available for companies to hire than there were when the unemployment rate hit 10 percent in 2009. The headline hiring figure, then, may no longer be the best measure of the job market’s health. Rather, it makes more sense to look at two other indicators: earnings and labor force participation. In a healthy economy, companies should respond to falling unemployment by offering higher pay to attract workers. That, in turn, should help draw more people off the sidelines, boosting the participation rate – the share of adults working or looking for work. Friday’s report was modestly encouraging on both measures. 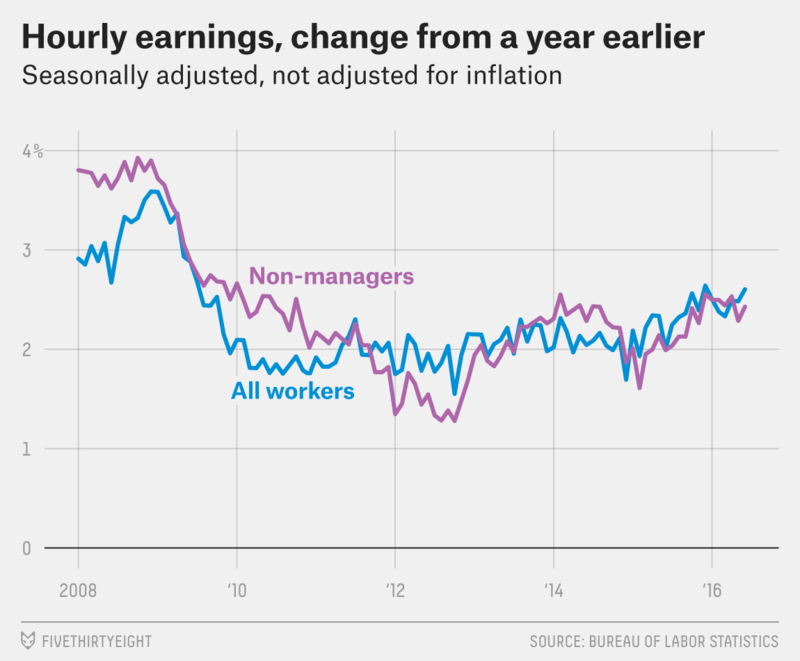 The participation rate rose slightly after two straight months of declines; average hourly earnings rose an anemic 2 cents in June from May, but the year-over-year rate of growth increased. Neither figure, however, was as rosy as the 287,000-job number that will likely dominate headlines. The real story, in other words, remains one of solid but unspectacular growth. Higher unemployment: The unemployment rate rose two-tenths of a percentage point to 4.9 percent in June, reversing most of May’s big drop. But the increase wasn’t necessarily a bad thing. 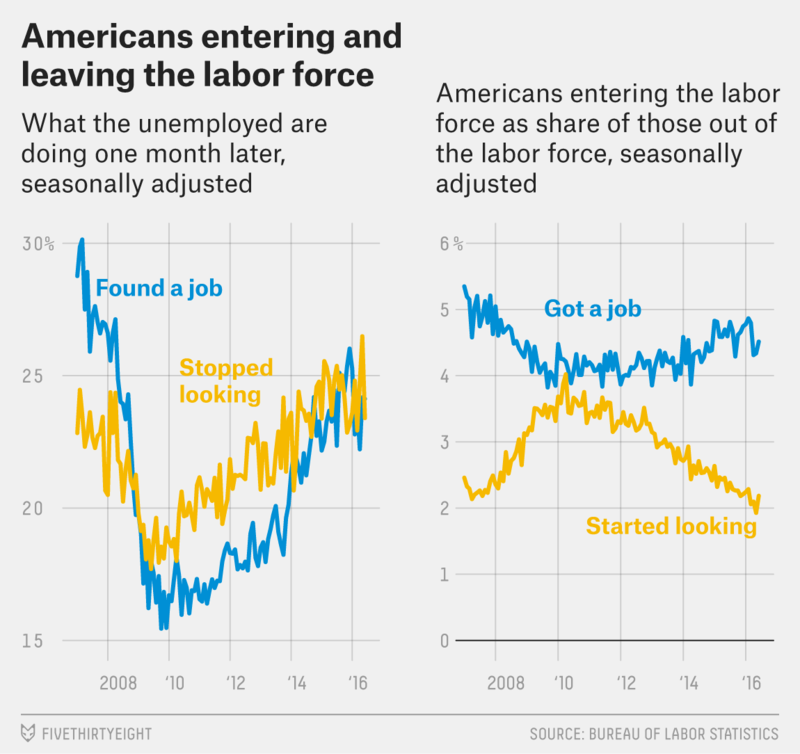 More people entered the labor force to look for work in June, a sign of confidence in the job market, and the job-finding rate – the share of unemployed workers who got jobs – stayed basically flat. Less ‘slack’ in the job market: The unemployment rate isn’t the only – or necessarily the best – indicator of how many Americans want jobs, because it counts only people who are actively searching for work. Other measures sent more positive signals in June. The participation rate – the share of adults either working or actively looking for work – ticked up after two straight months of declines. And the number of Americans working part-time because they couldn’t find full-time work fell in June after rising unexpectedly in May. The downward revision to May’s figures, however, was partially offset by an upward revision to April’s. 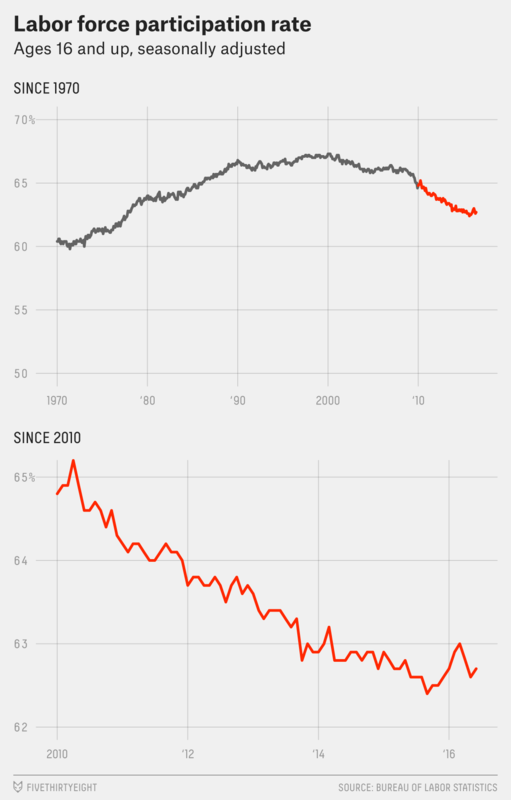 Taken together, the revisions mean that the U.S. added 6,000 fewer jobs this spring than previously believed. No ‘Brexit’ impact yet: Manufacturers added 14,000 jobs in June, mostly reversing May’s job cuts in the sector. But the data was collected too soon to include much if any impact from last month’s surprise decision by British voters to leave the European Union. The so-called Brexit led to a sharp increase in the value of the dollar, which could hurt U.S. exporters, because a stronger dollar makes American products more expensive overseas. The decision could also damage the overall global economy, further slowing trade. Fortunately, the domestic economy appears to be in relatively strong shape. Consumer-facing sectors such as retail and hospitality showed strong job gains, suggesting Americans continued to spend as they headed into vacation season. And high-paying sectors such as finance and business services also posted solid growth, which could boost consumer spending in the months to come.